Compare personal checking options to manage everyday spending. Compare business checking options to manage cash flow. Customized options to finance your dream home. Apply to become a member of our team. Friday: 8:30 a.m. – 5:30 p.m.
Saturday: 8:30 a.m. – 12:00 p.m.
F&M’s Harrisonburg, VA (Crossroads) location is across the street from Massanutten Presbyterian Church and from our Automotive Dealer Finance Division. Our convenient position off of Rt. 33 is also down the road from other businesses and restaurants. When you arrive at our bank you’ll find plenty of space to park around our stately brick building with black shutters and a protruding front that provides protection from the elements. 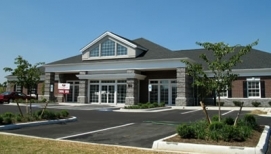 Our Harrisonburg (Crossroads) branch also serves customers looking for banks in nearby Penn Laird and Massanetta Springs. F&M is a community bank with a long history in Virginia’s Shenandoah Valley. We are proud to support the communities where our customers and employees live and work. Our local investment happens through programs like Perks@Work, which connects people to small businesses in their town, and through charitable projects such as F&M’s Casual Fridays for Charity and United Way Day of Caring. We have even received national recognition for our service to customers and communities. F&M Bank Corp., our parent company, ranked 4th out of 13 Virginia banks on the American Banker’s top 200 list of publicly traded community banks. Find out which of our financial services and solutions can help you reach your personal and business goals. Visit our Harrisonburg (Crossroads) location today to learn more about the services we offer and meet our friendly and professional team. Assistant Vice President, Farmers & Merchants Bank and Investment Consultant, Infinex Investments, Inc.
Staunton, VA – N. Augusta St.
to best handle our needs." believed in and supported our vision."